"Solid Microgaming casino - been around for years"
Nostalgia casino was originally an RTG casino that switched to Microgaming back in 2004. It was them and Phoenician casino – and a few years later were brought on by Casino Profit Share, and then onward to Casino Rewards. So yeah, they have had their share of owners and administrators, but they have had a low profile and not generated many complaints in the past few years. Unfortunately, the Casino Rewards brands began to offer their players bonuses if they would reverse their winnings, which violates our Accredited Standards for marketing. $/€/£4000 per week if a player wins a sum that is 5 times or more greater than their total purchases across all Casino Rewards partner casinos. All progressive wins/payouts are exempt from this clause. Microgaming is not only one of the leaders of online slots – but surely the leading developer of video poker. Unlike other casino software providers, Microgaming offers 54 video poker games, many of which rival the best IGT land based slots like Multi Strike Poker. So simply, if you are a video poker fan, Nostalgia casino is the place to be. 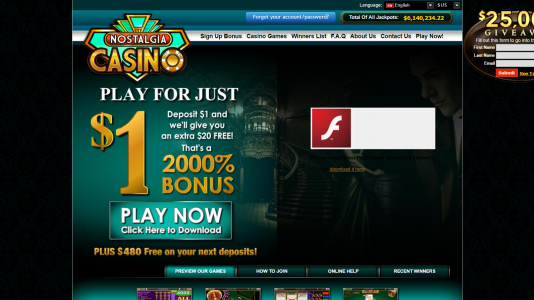 This casino goes way back to the early days of online gambling. Not many complaints, but they have virtually no presence in the player communities.